Dr. Irene Chung’s Expert Presentation. 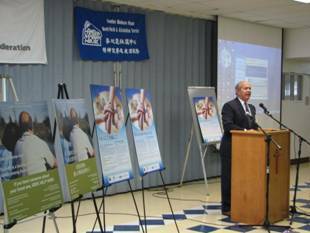 NYS Assemblyman Peter M. Rivera with the various Asian language campaign posters. 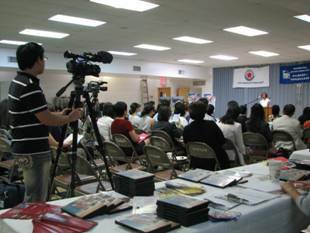 On Thursday, September 24th the Federation with Hamilton-Madison House and The New York Coalition for Asian American Mental Health held a press conference for the ongoing Elderly Asian Women Suicide Prevention Campaign. NYS Assemblyman and Chair of the Mental Health Committee Peter M. Rivera, NYS Assemblyman and Committee on Alcoholism and Drug Abuse Chair, Felix W. Ortiz, Dr. Lloyd Sederer, Medical Director of the NYS Office of Mental Health, Dr. Lily Tom, Assistant Commissioner of NYC Department of Health & Mental Hygiene and Dr. Irene Chung, Associate Professor at Hunter College School of Social Work addressed the audience about suicide among elderly Asian American women. 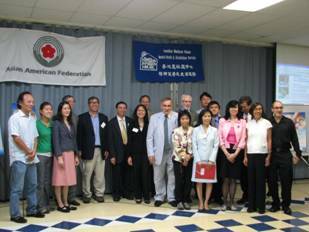 Representative from NYS Assemblywoman Grace Meng’s office was also present. The suicide prevention and awareness campaign is an important initiative for the Asian community because according to recent reports, suicide is the 8th leading cause of death for Asian Americans and Pacific Islanders and an alarming 40% of Asian American elders report depressive symptoms ranging from mild to severe. However, Asian Americans and Pacific Islanders are significantly less likely than others to mention their mental health concerns to a: friend/relative, caretaker, mental health professional, or a physician. 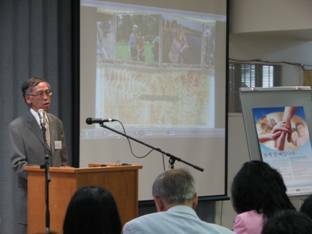 Please visit the campaign’s website at www.aaspe.net to find out more about suicide and depression in elderly Asian Americans, information on where to seek help for you or your loved one and for resources to help spread the awareness. The press release and media coverage from the press conference can be seen here.